Hear the rumbling of the waterfall as you glance at the glorious sea in this scenery painting. 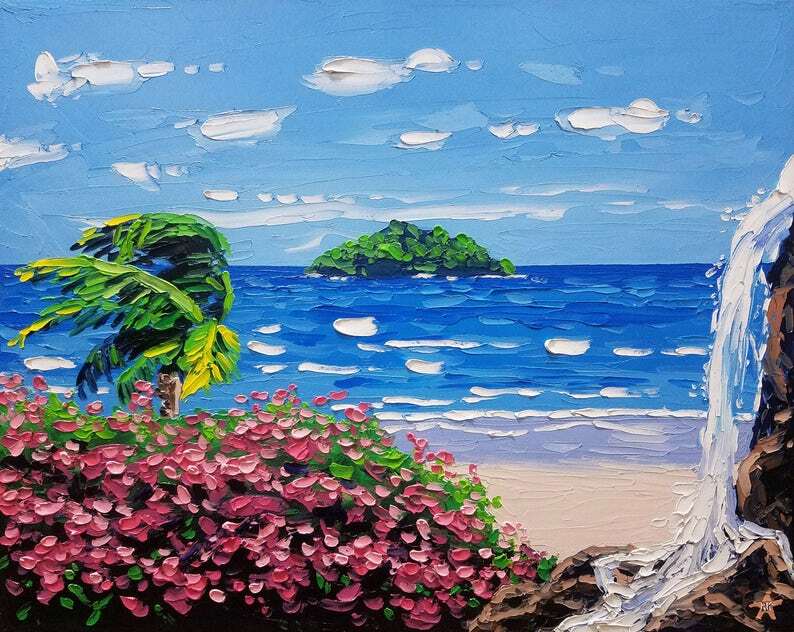 Watch the pink tropical flowers and palm tree sway in harmony to the crashing of the waves. Take it in. Feel it in your heart. Impress it in your mind. You are in paradise! **This seascape painting was painted using oil paints. It was created on high quality cotton canvas and is stretched and ready to hang. The sides of the oil painting are painted *tan* to give the art a professional look. You can hang it right out of the box! **This beach decor is 16 by 20 inches in size and comes with a certificate of authenticity, signed by me. The colors and rich textures of the painting make the work pop off the canvas. My 3-D style is very exciting and makes my art unique.